Although Transcription Tuesday is still a little way off, we’ve had a look at the first pages of the volume we’ll be working on, to test the transcription process and to get a sense of the stories it contains. Unsurprisingly, there are some serious, and sad, cases. Part of William Mercer’s entry in the ASRS volume. Courtesy: Modern Records Centre. Details aren’t exact, but this is believed to be the location of Mercer’s accident, on the lines north out of York. Detail from 1907 map. Courtesy: National Library of Scotland maps. In some cases – only around 3% of all worker accidents – state-appointed accident investigators held an enquiry into the circumstances of an accident. The ASRS volume included space to record details of these enquiries – but in Mercer’s case, the relevant columns were blank – a point to which we shall return. Instead, the next details given record Mercer’s dependents: a widow and two children. They were awarded £248.17.2 – around £25,500 at today’s prices. Finally, the volume carefully records the legal costs associated with Mercer’s case: £3.10.6 paid to Brumbie and Sons. Some of the other records are rather fuller, especially when it came to those left behind, but even in this case we have some detail that we might not find in other ways, including the financial arrangements for the bereaved family and a sense of how much a life was worth in 1901. This isn’t the end of the story, however, as we’re able to do one further thing with Mercer’s case – something we hoped would be possible, and which early indications suggest may be replicated across the volume: we can link it with other records, to get a fuller picture of Mercer’s working life and death. Guard signalling from van, c.1930s, Guide Bridge – an indication of the sort of role and conditions under which Mercer would have been working. (c) National Railway Museum, 1995_7233_LIVST_DM_129. Although no details were entered in the columns in the ASRS volume, the Railway Inspectorate did investigate Mercer’s case, and the report survives at Search Engine at the NRM. From it we learn that 32 year old Mercer had been 9.5 hours into his 10 hour shift: was tiredness a factor? Regardless, as the guard, Mercer was in charge of the train, which consisted of 36 wagons. At the York siding they wanted to uncouple the brake van only from the rest of the train. Mercer did this – as he no doubt had done plenty of times before – whilst the train was moving. The intention was that a pair of points would be thrown over after the train had passed it but before the guard’s van had reached it, thus diverting the guard’s van into a parallel siding. This was duly achieved – or, nearly achieved. The brake van came to rest on the points, foul of the next line. The driver, Charles Shipley, stopped the train; wagon greaser B. Atkinson (presumably working nearby – possibly on the mineral train), came to help clear the lines, as they couldn’t leave the route blocked. They tried to move the guard’s van by hand, but in the confusion about roles and signals, noticed that the rest of the shunting was continuing. 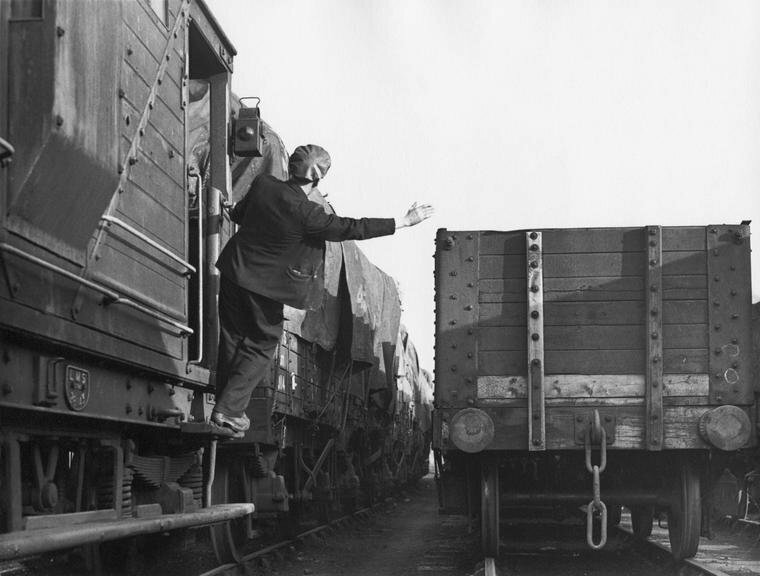 1914 accident prevention image – the problem identified concerned the hands on the buffer head, which would have been crushed if the buffers met, rather than pushing a wagon by hand. The points had not been altered, which meant the wagons were heading straight for the brake van Mercer was working on. One of these wagons hit the brake van, ‘causing it to be driven sharply back’ and resulting in the death of Mercer, who was standing behind the brake van (trying to remove a lamp). The report goes into a little detail about who was responsible for the accident, finding a combination of factors made for unclear signalling between the driver at one end of the train and the guard at the other. As part of their role, the Railway Inspector was able to make recommendations for future cases, and in this case Inspector JJ Hornby, did have some suggestions: chiefly that the company responsible, the North Eastern Railway, should provide a signal to help with visibility in this location. 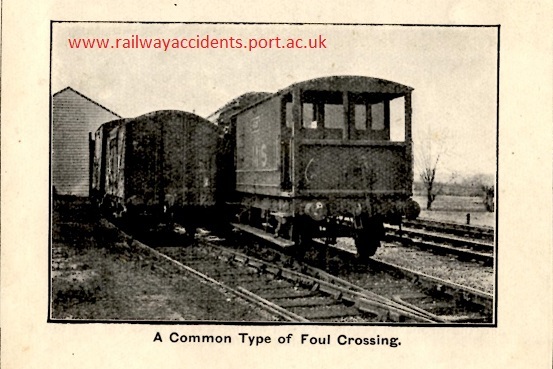 Interestingly, the report notes an unorthodox and surely unapproved form of practice by the workers: as they couldn’t see the signals by the driver, they would ‘climb upon the wagon buffers for signalling purposes, which causes risks for which there does not appear to be any necessity’ (Railway Inspectors report, first quarter 1901, Appendix B). Why didn’t the Union send someone to represent Mercer at the Inspectorate’s enquiry? We can’t say for sure, but it might be to do with workload. Just like the railway inspectors, the Union’s ‘organising secretaries’ were in demand, and had a big portfolio of tasks spread amongst a small number of individuals. Logistically it was impossible for the union to be present at all enquiries – and presumably Mercer’s was one of those they could not make. There were certainly plenty of enquiries, given for the period covered by the Transcription Tuesday volume, 1901-1905, there were 2,432 worker deaths and 71,850 injuries. Even if only 3% were the subject of an enquiry, and only some of those involved union members, that still leaves a huge number at which the ASRS (and other unions) would have needed to find representation. Combining the sources as we’ve done here reveals different aspects to Mercer’s story – but this is only as good as the individual sources. The ASRS volume is just one of the documents at the MRC that we’re currently working on with onsite volunteers[; together they help us to understand the difficulties workers faced when doing their jobs in high-risk environments. We’re expecting lots of stories like this to emerge from the volume – but can only do it with your help on 5 February!